If you don't trust your bank, you're in good company. With financial regulations unraveling, and in the wake of several shocking banking scandals, it's remarkable we haven't all switched to a digital crypto-currency like Bitcoin and ditched our financial institutions. The latest EY Global Consumer Banking Survey finds customers around the globe have diminishing trust in their banks. While they broadly trust banks to look after their money securely across markets, few have complete trust in their banks to give them unbiased advice that puts customers' interests first. In the United States, 57 percent of customers trust their bank but only 33 percent say their financial institution will provide unbiased advice. Those numbers are comparable to the levels of trust found in Germany and Mexico. Question is, how will banks go about erasing trust? To find out, I asked the financial experts. Banking scandals such as the Wells Fargo fake account debacle, in which it opened 1.5 million accounts without authorization, do nothing to help the situation. There's also a long history of banking scandals, including those that led to the Great Recession. Perhaps the biggest lie is that the banking industry has learned from its mistakes. It clearly has not. "Don't fall for the trap of free checking accounts, because they come with several strings attached," warns Chris Moon, a banking analyst for ValuePenguin.com. He notes that banks often stipulate certain minimums for balance or activity before they will waive your monthly account fee. "The most common requirements are to establish a certain amount in direct deposits to your account, keep a daily minimum balance of a certain amount and make a certain number of debit card purchases each month," he says. And if you don't? Well, then it's not "free," and you're stuck with a bank account that can be pricey. Bottom line: "free" is a lie for some customers. These products confuse customers, according to a study by the Oakland, California-based California Reinvestment Coalition involving secret shoppers. It found banks' explanations of overdraft programs were "highly inconsistent" and often unclear and incorrect. In other words, they lied. “Overdraft on ATM withdrawals and debit purchases is a debt trap that pushes lower income people out of the banking system," noted Josh Zinner, co-director of New Economy Project, one of the organizations that participated in the study. "Regulators should ban this product," he concludes. Speaking of overdraft fees, that's where banks getcha. "Some banks -- mostly smaller ones -- will reorder your transactions from highest amount to lowest, instead of chronologically," says Nick Clements, co-founder of the financial website MagnifyMoney. "This lets them charge multiple overdraft fees. There's still a considerable percentage of the industry that does this." Of course, that's highly unethical -- stacking the deck in favor of the bank. But in the absence of regulation, this is what happens. Yes, we're a family business! 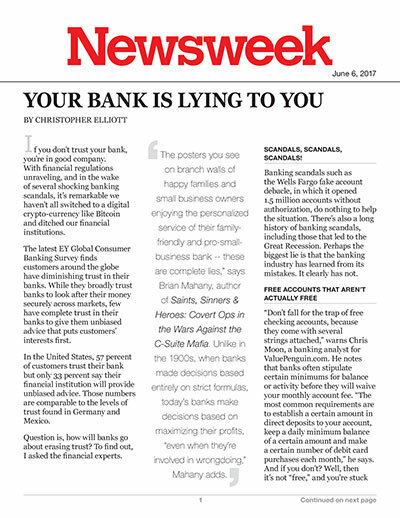 "The posters you see on branch walls of happy families and small business owners enjoying the personalized service of their family-friendly and pro-small-business bank -- these are complete lies," says Brian Mahany, author of Saints, Sinners &amp; Heroes: Covert Ops in the Wars Against the C-Suite Mafia. Unlike in the 1900s, when banks made decisions based entirely on strict formulas, today's banks make decisions based on maximizing their profits, "even when they're involved in wrongdoing," Mahany adds. I know what you're thinking -- there ought to be a law! Problem is, when you rein in overdraft shenanigans, protection rackets, "free" accounts and clamp down on the scandals du jour, banks will always find a way around it. It's not to say regulations are unwarranted, only that the banks will probably be a step ahead of the law. And that's why you have to stay a step ahead of your bank. Not that you should expect a lie from your banker whenever he opens his mouth, but by all means, you should not trust your bank blindly. Do that enough, and you've got all the makings of the next big financial crisis.